The Opus Vermiculatum, from the Latin “worm-like work”, is an expressive technique, considered one of the most demanding and elaborate forms of Roman mosaic. The tesserae were laid along the contours of the image to put emphasis on the main design and foreground details of the work, using a smooth and flowing halo effect. In those small carpets called “Emblema”, the tesserae were tiny up to 1 or 2 mm each, that makes possible up to 5 rows of tiles, with different color shades, in just one centimeter! Historical facts have demonstrated that Romans developed a technique to remove those precious mosaics from a floor to another one, since they were so expensive and complicated to make, even at that time. 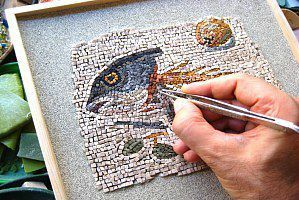 In this 5-day class is taught how to make a mosaic in miniature (size approx 10 x 15 cm – 4” x 6” inches) following the Vermiculatum “andamento” rules.